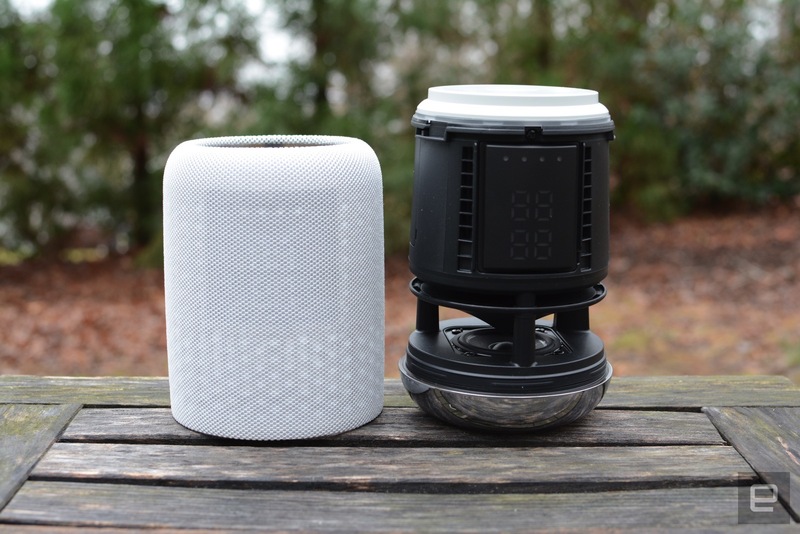 The smart speaker isn’t perfect, but it does a lot of things well. The options for Alexa- and Google Assistant–powered speakers have exploded, as evidenced by companies adding voice control to any and every device at the last two CESes. As is typically the case when pretty much everyone hops on a bandwagon, there's some good and a lot of bad. The concept of voice control is still new to a lot of people, so when they do splurge for that first device, it had better work right. Sony's LF-S50G harnesses the smarts of Google Assistant to do just that, but it's far from perfect. Sony’s smart speaker sounds better than a lot of the competition, but gesture controls need some fine-tuning. Be the first to review the LF-S50G? Sony isn't known for clever product names, opting instead for a seemingly arbitrary mix of letters and numbers most of the time. That's obviously the case here with the LF-S50G. Announced back at IFA, the company's first smart speaker is comparable in size to the original Google Home but noticeably smaller than the Sonos One (and Play:1). It's short and compact, taking up a minimal amount of space on your countertop, desk or nightstand. Like much of its competition, the LF-S50G is a 360-degree speaker that blasts sound in every direction. Most of the outside is a cloth-mesh speaker cover, save for the polished-chrome base. Sony realizes that you're likely to keep the LF-S50G in the kitchen, so that cover can be removed for cleaning, in case you splash tomato sauce on it while cooking. 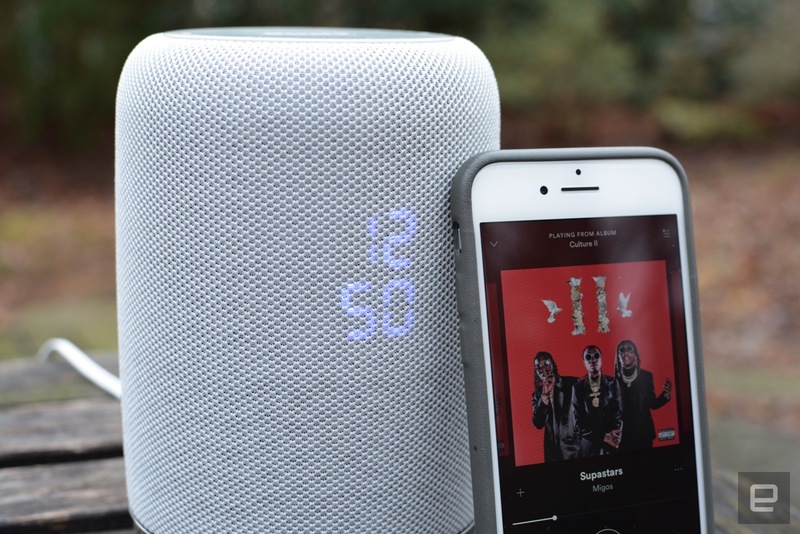 The speaker itself also has an IPX3 splash-proof rating, so you don't have to worry about the occasional water spray or spill -- just don't submerge it and you should be fine. One design element that's kind of unique to the LF-S50G is a clock on the front. The stacked numerals may not be your first preference for a timepiece, but at least you don't have to ask out loud for the time. It's not a necessity, but it's a nice touch, and for me it meant having the option of using the speaker as a true alarm clock. The initial setup itself is a breeze, thanks to the Google Home app. I had everything up and running in about five minutes. In terms of onboard controls, primary adjustments on the LF-S50G are done with touch-free gestures on the top panel. You hold your hand over the top and, following specific movements, you can adjust the volume, play/pause, skip songs or summon Google Assistant. It sounds good on paper, but these gesture controls were a source of constant frustration. First, it can be difficult to get them to work on the first attempt. I often found myself doing the same movement three or four times (in some cases, more than that) before the speaker got the hint. More often than not, I just used my voice and had Google Assistant make the adjustments for me. After a few days, though, I did find that actually placing a finger on the top of the LF-S50G before starting the circular motion that's used to control volume helped. Basically, if you treat the top like a touch ring or dial, Sony's speaker does a better job of picking up on what you're trying to do. When it works, it's great. But the company is advertising "touch-free gestures," and, for me, they just weren't reliable. The only physical buttons on the LF-S50G are around back. There you'll find options for Bluetooth and turning off the microphone on either side of the power jack, on that shiny silver base. It's nice that Bluetooth is there, but I only ever used it to make sure it works. Since Google Assistant needs a WiFi connection to work, I mostly employed the LF-S50G to control external Chromecast-enabled devices like... well, a Chromecast and other connected speakers. Of course, you can link your music service account as well, so you really don't need to beam audio from a phone or computer except in a handful of cases. Since voice control is what makes the LF-S50G more than just another connected speaker from Sony, that key selling point has to work well. I'm happy to report it does. After spending a few weeks with the device, my gripes with the voice feature entirely have to do with the limitations of Google Assistant. It can't tell me what channel the Hornets game was on, for example, but it can give me a full list of the day's games. That's a question Assistant can't answer, but Siri can. 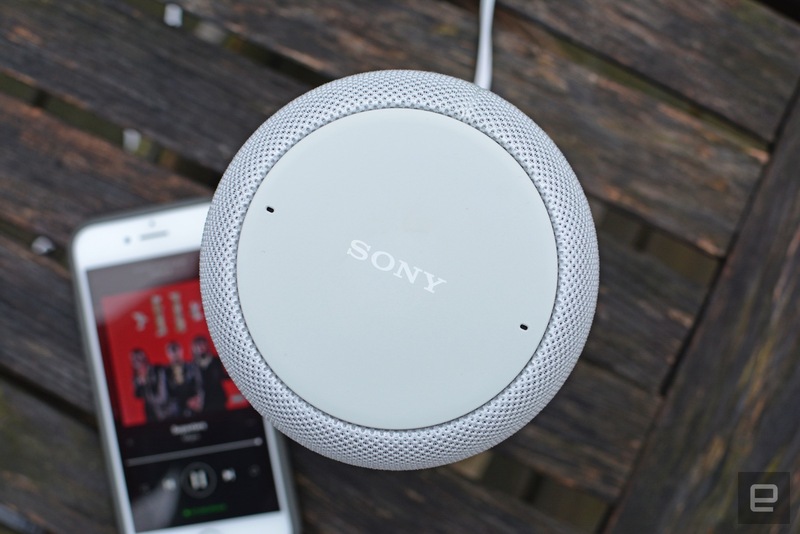 However, Sony's smart speaker always accepted my commands, even when it was playing music or there was other noise in the room -- I didn't have to repeat myself to get the point across. Even if I didn't always get the answer I wanted. The likes of Amazon Echo and Google Home have visual indicators to let you know the virtual assistant is listening or responding to your query. Sony's LF-S50G does as well. Four white dots, located just above the clock on the front, light up when you're speaking a command. And when Google Assistant is responding, all four are lit up together. I'd say 80 percent of the time I wasn't looking at the speaker when asking it for help, which is kind of the whole point anyway. There's also a ring of white light around the top that illuminates when you use the gesture controls and the clock numerals switch to volume level when you're turning that imaginary knob. Sony beats the Echo in terms of sound quality, as well as the original Google Home. The company has a long history in audio gear, so it's no surprise its first smart speaker sounds pretty good. Let me be clear: Good doesn't mean great. This speaker sounds best at medium volume, where it has a good amount of bass and the highs are kept in check. Dial it up to louder levels and the treble starts to take over. There's no distortion, but the audio isn't nearly as balanced. Some genres sound better than others -- mostly due to the lack of low-end tone. That issue isn't unique to this device, though. A lot of these compact smart speakers can't muster enough bass, and as a result, sound quality struggles. Even though the tone range may not be the best, the LF-S50G makes up for it with clarity. Again, that's best showcased at medium volume. When I cranked up my go-to playlist for testing audio quality (a mix of metal, rock, bluegrass, electronic, hip-hop and more), some of the detail was missing if the music was loud. As far as I'm concerned, these two audio grumbles aren't deal breakers. Let's face it: You're probably not going to use one of these to power a house party. Google Assistant is the main attraction, but it doesn't hurt that the speaker also has decent audio -- even with its caveats. While Sony's smart speaker does sound better than some other Alexa and Google Assistant devices, Sonos is still tops in terms of audio quality. Sure, the Sonos One works only with Alexa right now, but when the speaker debuted, the company promised that support for Google Assistant was on the way. What's more, the LF-S50G costs the same as the Sonos One ($199), so if you can hold off, you won't have to pay extra for better sound quality. There's still no arrival date for Assistant on Sonos One; the company says it won't get more specific than "in 2018." It is coming, though, and when it does, Sonos will have one of the best-sounding Google Assistant speakers available -- perhaps outperformed only by the $400 Google Home Max. However, the likes of B&O and Klipsch have announced plans to include Google Assistant on future devices, so it's in Sonos' best interest to support a second virtual assistant as soon as possible to cater to the Google faithful. If audio quality isn't your primary concern, the second-gen Echo and regular Google Home are both cheaper than the LF-S50G, at $100 and $129, respectively. 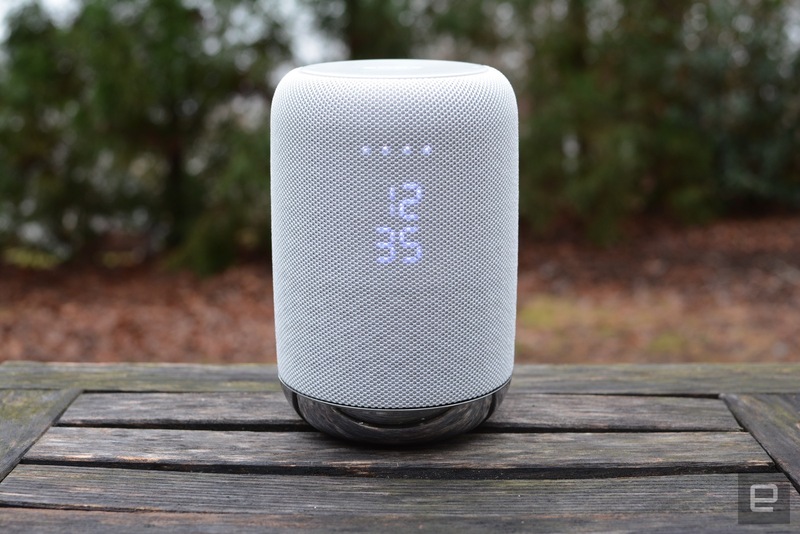 The Echo Plus is also cheaper than Sony's smart speaker, at $150, but as my colleague Devindra Hardawar noted in his review, improved sound quality and a smart home hub doesn't make it that much better than the original Echo. As I mentioned before, Sony does a respectable job here with audio, and is noticeably better than the base-model Echo and Google Home. If you're after something that sounds better, you'll be glad you spent the extra money on an LF-S50G or Sonos One. Aside from the somewhat unreliable gesture controls, I have no major gripes with Sony's smart speaker. Sure, there were some minor frustrations, but some of those issues are Google Assistant–related (like the channel question) and some are just the shortcomings of virtual assistants in general. They're helpful, but they can't answer every question you throw at them... yet. The LF-S50G is compact and has an unassuming but attractive design, so it should blend in well on a shelf or sitting on your kitchen counter. For $70 more than Google Home, Sony does offer better audio, a premium I'm happy to pay for. Sure, the Sonos One will offer better sound quality for the same price when the company adds Google Assistant. Right now, though, we don't know when that will be. That being said, if you're ready to commit now, Sony's smart speaker is a worthy alternative to Google's gear, even with its shortcomings.